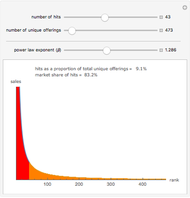 The Long Tail is a term coined by Chris Anderson to refer to the power law relationship between the rank of a product by market share and its level of sales. 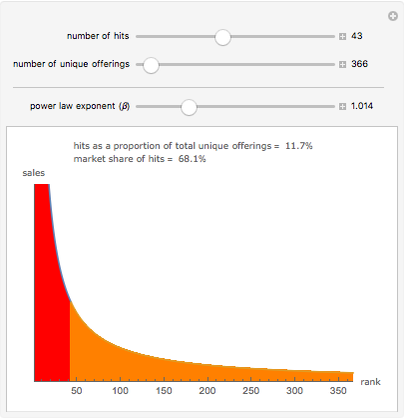 If represents a product's rank, then its level of sales will be proportional to . Anderson argues that as the number of unique product offerings expands, the traditional order following an 80/20 rule is giving way to a new order in which market share is shifted from the hits (the head of the distribution represented in red) to niche products (the long tail represented in orange). Fiona Maclachlan "The Long Tail"